It is often that we talk about the wedding and not the venue, however the venue itself is actually the soul of the wedding preparations particularly if you want the best for your wedding!. As we are aware, wedding venues in general have so much to offer and will take your wedding to another level. To ensure you have a wonderful wedding experience read on to see a selection of the best-picked wedding venues with gardens in your city Udaipur! Through a short, pleasant stroll around the heart of the old city, you will notice how remarkable Udai Kothi is for its tranquillity and magnificence. With its many conceptualized designs, Udai Kothi is a superbly modern hotel which pampers you with all the facilities, amenities and luxuries a 21st-century traveler expects. Giving you an extra edge for having your pre wedding rituals like Mehndi in their lush green beautiful garden. 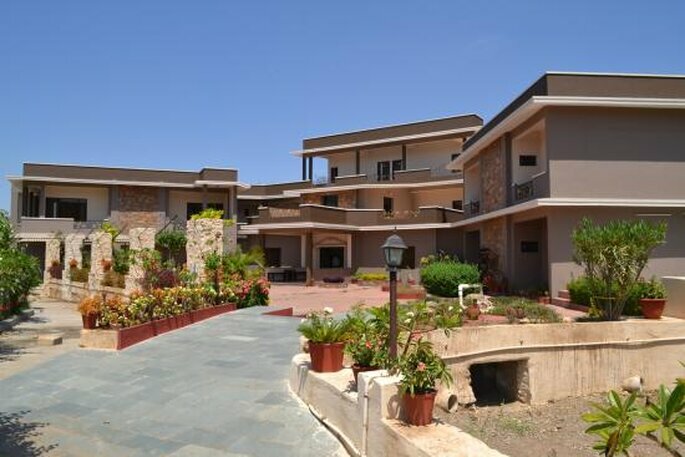 Run by Kunwar Vishwavijay and his wife Bhuwneshwari Kumari, Udai Kothi has 64 well-appointed Luxury Rooms & Suites with International Amenities & traditional decor. 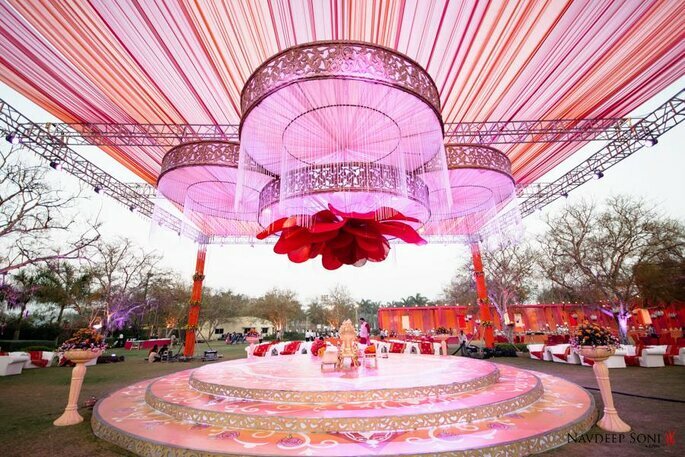 Having a garden within the wedding venue is a bonus and one can celebrate their other ceremonies like Sangeet there easily without moving out of the venue. 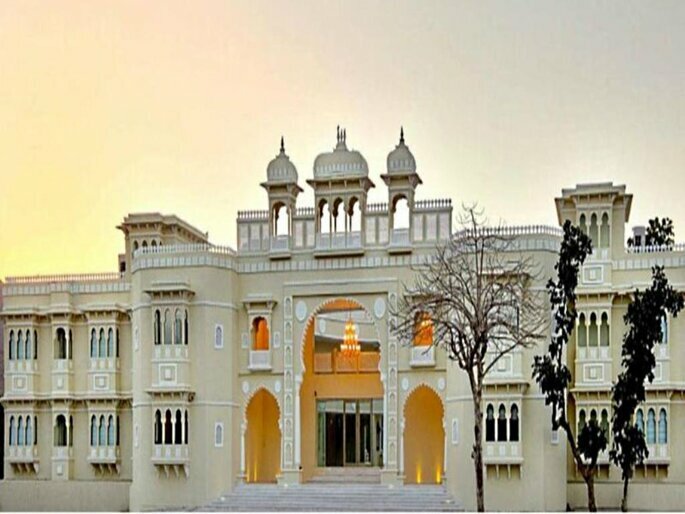 Deogarh Mahal was converted into a Heritage Hotel by the Deogarh family members. A part of the Mahal is still occupied by them. The family is closely associated with the hotel and personally supervises and manages it with various amenities. 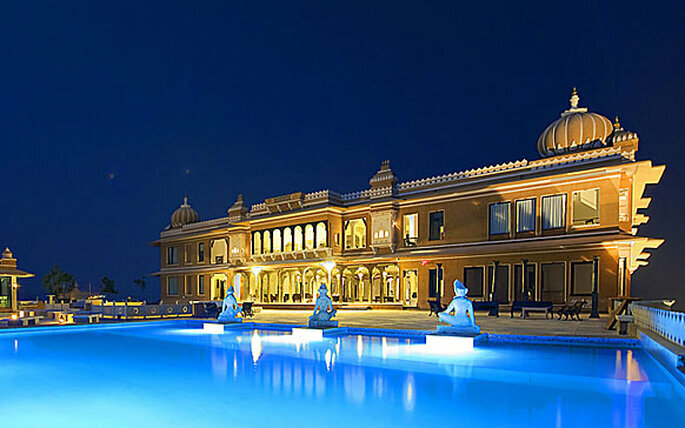 The care is reflected by the minutest details which have made Deogarh a benchmark of Heritage Hospitality in Rajasthan. Every guest here is special and is treated with the customary Mewari hospitality. The laborious transplanting of the stone by stone, pillar by pillar of a heritage structure from a place not very far away to a new context – fresh and exciting; is truly an innovative creative expression in the dynamic world of travel and tourism. 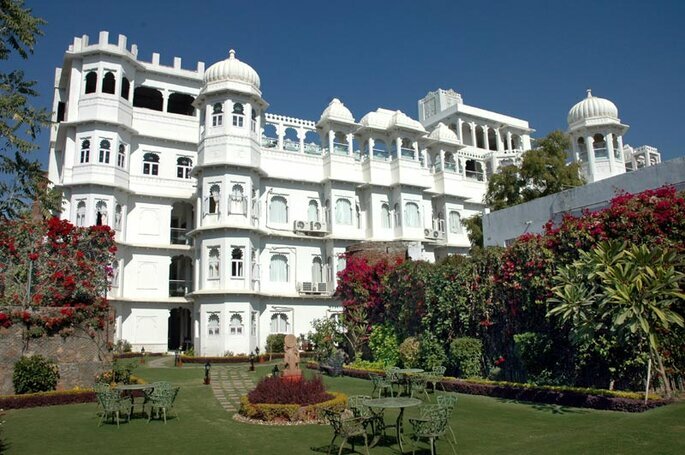 Everything at their hotel in Udaipur is indeed a Heritage Hotel aka Heritage Palace and has been conceptualized, designed, and executed to revitalize the environmental – cultural – spiritual heritage of the past. Along with the major facility of the garden within the venue which solves the biggest problem of organizing small ceremonies like Mehndi or Sangeet. Meetings and special event spaces at Shouryagarh help you experience the best of royalty with the best services and a beautiful garden where you can have your wedding reception and other ceremonies. Designed to cater to the business and social needs of the most discriminating clientele, their resort features over 2,00,000 square feet of indoor and outdoor event space, including the expansive Sangam Hall, Sangam Porch, the humongous vintage garden to name a few! Shouryagarh’s luxury conference venues are perfect for corporate conferences, weddings, executive retreats, and other business events in Udaipur. 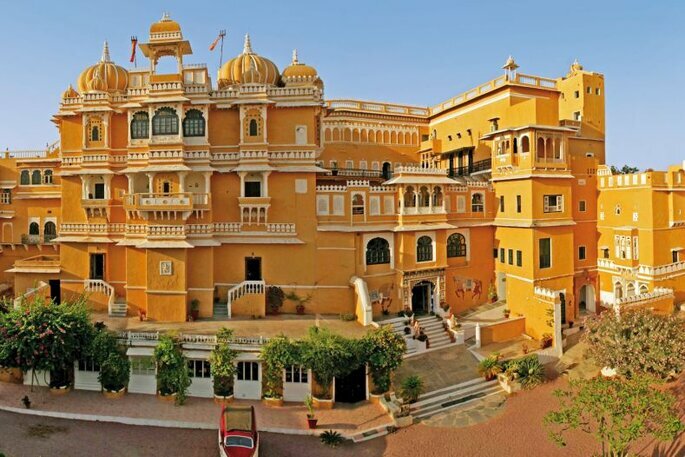 Hotel: Shouryagarh Resort & Spa. 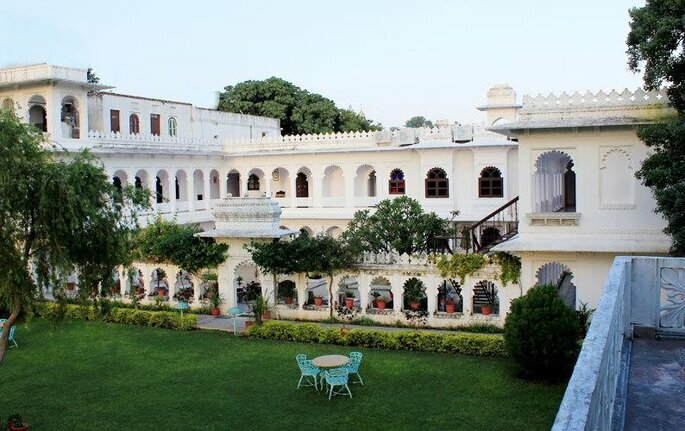 Araliayas in Udaipur is a privately owned estate; located amidst the scenic mountains of the Aravali range your first impressions of Araliayas will probably be the space, peace and the breathtaking panoramic views. The privacy, location and the splendid views provide a lush green scape that rejuvenates the senses and designed in a way that merges the indoors seamlessly with the outdoors. It is the ideal place to relax, unwind and soak in what promises to be an unforgettable experience. The best part about the venue is the beautiful garden along with it which helps in celebrating your small get together before the wedding. The hotel has 20 Rooms each room is comfortably elegant, with attached bathrooms fitted with modern amenities and not to forget its beautiful garden which can be used for mehndi or sangeet ceremonies. All restorations and alterations on the Mahal have been carried out, bearing in mind the old architectural style of the building. The idea was to offer the weary traveler, the comforts of today with an ambiance of the past and the decor reflecting the Rajput era. The architectural design of Badi Mahal is basically influenced by the Mughal Gardens of Agra Fort and the Red Fort at Delhi. So without hesitation, go and choose a fantastic venue of you choice with a spectacular garden for your wedding and enjoy all the amenities and comfort in your wedding.